Robotic-assisted prostate arterial embolization (PAE) is an option for interventional radiologists that can reduce radiation exposure and may potentially help improve technical success rates. Interventional radiologists at the Vascular Institute of Virginia in Woodbridge conducted an analysis comparing manual and robotic procedures and their outcomes, reporting their findings in the March issue of Cardiovascular and Interventional Radiology. 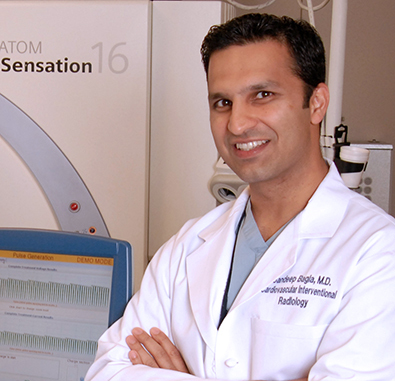 PAE is a noninvasive alternative to surgery for men experiencing the symptoms of benign prostatic hyperplasia (BPH). However, the procedure is considered to be technically challenging. Principal investigator Sandeep Bagla, MD, and colleagues note that the challenges are related to internal iliac artery atherosclerotic disease and tortuosity that are common in older male patients. Specifically, the major difficulty relates to proper placement of guiding catheter such that a microcatheter can access the prostatic artery due to variations in the arterial size and the degree of atherosclerosis among patients. Adoption of PAE by interventional radiologists in Europe and the United States has been limited. The authors believe that if higher technical success rates could be achieved, if consistent clinical outcomes could be reported, and if lower occupational radiation exposure from fluoroscopy could be reduced, adoption rates would escalate. They conducted a study to determine if robotic assistance would provide any advantages for the patient and the radiologist compared to manual embolization. The study included 40 men who underwent PAE, 20 with robotic assistance. The men ranged in age from 49 to 81 years with moderate to severe grades of BPH. There was no significant difference in patient demographics, the American Urological Association symptom index (AUA-SI) score, or quality of life between the two groups. Patients were not randomized, but rather underwent robotic-assisted surgery if the robot was available for use. The authors defined technical success by bilateral embolization under stasis, and clinical success as reduction of the AUA-SI by three points. For each procedure, radiation dose as estimated by interventional radiology suite fluoroscopic equipment, fluoroscopy time, total procedure time, and cost were recorded. The PAE procedure was technically successful in all 20 patients undergoing the robotic procedure and 19 patients having the manual procedure. The sole patient who had a technical failure subsequently had the procedure performed again with robotic assistance, with successful results. This very difficult case represented the value a robot could provide, a case which the authors describe in detail in the article. The interventional radiologists using a robot (Magellan Robotic System, Hansen Medical, Mountain View, CA) operated the system from a workstation located 3 feet further away from the radiation source than when they performed the embolization manually. The authors did not measure in real-time the actual radiation exposure to the operators. The fluoroscopy radiation dose to the patient was slightly lower when the robot was used: 30,632.8 mGy/cm2 compared to 35,890.9 mGy/cm2 for the manual procedure. Total mean fluoroscopy time was similar: 29.5 minutes for the robotic procedure and 27.8 minutes for the manual procedure. Total mean procedure time also was non-significant: 89 minutes and 82 minutes respectively. No major or minor complications occurred in either group, and no delayed complications were identified. There were no significant differences between the two groups at 1- and 3-month follow up for AUA-SI and quality of life. The big difference between the two types of procedures was disposable cost. Use of the robot increased disposable cost by more than three times: $4,530 compared to $1,588 for the manual embolization. Bagla S, Smirniotopoulos J, Orlando JC, et al. Robotic-Assisted Versus Manual Prostatic Arterial Embolization for Benign Prostatic Hyperplasia: A Comparative Analysis. Cardiovas Intervent Radiol. 2017. 40;3: 360-365. Robotic-assisted prostate arterial embolization: Clinically feasible but costly. Appl Radiol.